I've been looking into the matter of Gunner George Ridgway (not Ridgeway, as per the MM citation). He was from Lang Lang in Victoria, and was witness to the shooting down and death of The Red Baron. In fact, it is stated that he was the first person to reach the crashed red triplane, having watched the events from the top of a brick stack. He was adamant that it was Australian machine gunners who shot down the Baron, not the pilot who claimed the kill. It is only in recent years that Ridgway's account of events has been accepted and supported by a re-examination of the medical/forensic evidence. Ridgway also managed to scrounge, and keep, the 'number plate' of the red Fokker Triplane. This explains why Jack was always totally convinced that The Red Baron was shot down by Australians. He, of course, knew George Ridgway very well and was certainly in the vicinity at the time. This happened on 21 April 1918. Jack and George won their MMs together on 24 April 1918. 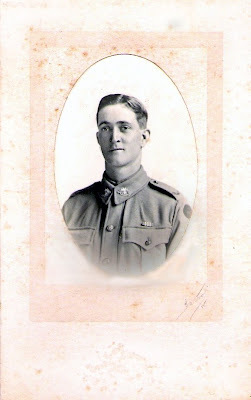 Note 20 March 2010: I have discovered that George Ridgway was also a witness to the death of Gunner C V Moody, of the 30th Battery 8th FAB on 18th October 1917. A pass made out in the name of Gunner Moody was amongst Jack's collection of "stuff".